Practical Guides in Chemical Engineering are a cluster of short texts that each provides a focused introductory view on a single subject. The full library spans the main topics in the chemical process industries that engineering professionals require a basic understanding of. They are ‘pocket publications’ that the professional engineer can easily carry with them or access electronically while working. Each text is highly practical and applied, and presents first principles for engineers who need to get up to speed in a new area fast. The focused facts provided in each guide will help you converse with experts in the field, attempt your own initial troubleshooting, check calculations, and solve rudimentary problems. Solid-Liquid Filtration covers the basic principles and mechanisms of filtration, filtration testing including filter aids and filter media, types of filtration systems, selection of filtration systems and typical operating and troubleshooting approaches. 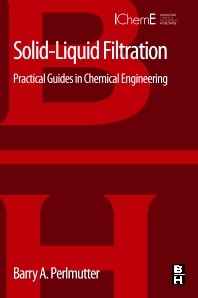 This guide also discusses general applications and tips for process filtration and can be utilized by process engineers as a framework for “idea-generation” when analyzing filtration for an operating bottleneck issue or a new process development problem. Process engineers, plant engineers, researchers, professionals. Barry A. Perlmutter is currently President and Managing Director of BHS-Sonthofen Inc., a subsidiary of BHS-Sonthofen GmbH. BHS is a manufacturer of filtration, washing and drying technologies as well as mixing and recycling technologies. Barry has over 30 years of technical engineering and business marketing experience in the field of solid-liquid separation including filtration and centrifugation and process drying. He has published and lectured extensively worldwide on the theory and applications for the chemical, pharmaceutical and energy / environmental industries and has been responsible for introducing many European companies and technologies into the US marketplace. Barry began his career with US Environmental Protection Agency and then Pall Corporation. He received a BS degree in Chemistry from Albany State (NY) University, MS degree from the School of Engineering at Washington University, St. Louis and an MBA from the University of Illinois. President & Managing Director Filtration, Mixing & Recycling Divisions BHS-Sonthofen Inc. USA.